marker fight! haha! that sounds like something Coop dog would say. You and Stratton better start being nice to each other. haha! you guys stay out of trouble. we miss you both! oh misti you are so cute! even with your marker face!!! Marcus and I teach the five year olds too. They say the funniest stuff. Ha. You two be careful there in Alamosa! Hope you heal up :) It was fun watching your games this weekend (on the TV/computer) Go Grizzlies! 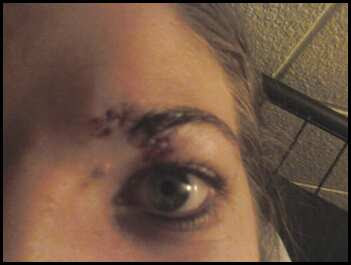 I remember that bball fight between Traci and Tricia...it might have traumatized me a little bit. You look very very tough and scary Misti- looks good on you haha. What are your plans for when you grow up? Wow Misty! You guys need to stop beating eat other up!!!! Ha!